I’m delighted to have as a guest writer one of WA’s most respected and loved writers: Amanda Curtin, the author of a collection of short stories, Inherited; and two novels, The Sinkings and Elemental (the latter shortlisted for the WA Premier’s Book Awards). Amanda is also one of our great editors, always meticulous, thoughtful and diplomatic, and is much admired for her unstinting support of other writers. 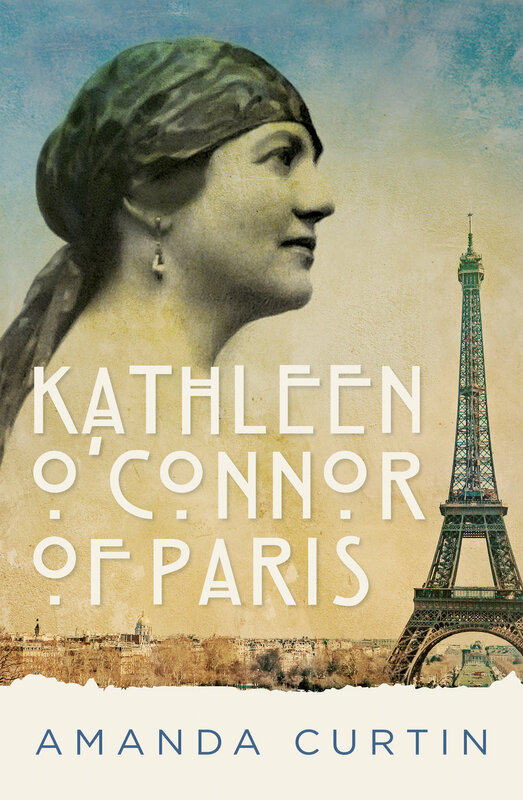 She kindly agreed to share her thoughts about the challenges and pleasures of researching and writing her new book, a work of creative non-fiction called Kathleen O’Connor of Paris. What attracted you to the subject of your new book? The fascinating Kate—Kathleen Laetitia O’Connor, daughter of C.Y. O’Connor—has intrigued for several decades, ever since I heard about her and saw her art while working in a minor editorial capacity on the first biography about her, which was published in 1987. I loved her work, and the story of how this strong young woman defied social and family expectations to pursue a career in art in Paris was something I never forgot. The path between that first impression and the publication of Kathleen O’Connor of Paris winds its way from artform to artform. I wrote a short story inspired by Kate’s art and an episode in her life that I had heard about back in the 1980s, that story led to an exhibition by Fremantle artist Jo Darvall, which then prompted Georgia Richter from Fremantle Press to tentatively enquire whether I might be interested in writing a work of creative non-fiction about Kate. It was a big decision to make, in the sense that I was working on something else at the time—something that would have to be put aside for a few years—but my heart said yes straight away! What was the most startling discovery you made in the course of your research for this book? I remember one day when I was working my way through the Battye Library archives pertaining to Kate—a huge job that took several months—and I came across a beautiful original sketch tucked into the back of a manila folder. I knew it wasn’t Kate’s work, but there was something arresting about it. I studied the signature, partially obscured by a tear across the bottom of the board: it looked like ‘Steinlen’. That rang a bell: there was a catalogue, inscribed to Kate, among her papers for an exhibition by Steinlen in 1917. I checked the signature, and yes, it was the same. Théophile-Alexandre Steinlen is perhaps not a name everyone would know, but his Black Cat poster is instantly recognisable, probably as famous as Toulouse-Lautrec’s as symbols of Paris. Kate’s connection with Steinlen probably dates back to the prewar period. He was one of the tutors at Académie Colarossi, where she had taken sketch classes. But I continue to be intrigued by the presence, without context, of this original sketch among her effects. You are the author of three works of fiction, and your new book is classified as creative non-fiction. What similarities and differences did you find between the two genres? Creative non-fiction is a factual narrative that makes use of fictional techniques, as well as facts, to tell a story, and often involves the author in the narrative. Within this loose definition lie the greatest similarities and the greatest differences. It was my own presence in the narrative that presented me with the greatest challenge. I am not accustomed to stepping into a story, and prefer to let my characters do the talking! But there is no doubt in my mind that this was the most effective way to tell Kate’s story. It allowed me to speculate, to question, to imagine in a transparent way, honouring the pact that any non-fiction writer makes with the reader not to ‘make things up’. It also gave me a way to take the reader along with me through the process of research—although only the highlights! Probably the bulk of any research effort would be classified as ‘not a spectator sport’. What was the most pleasurable aspect of writing your new book? I love research, period. But when I think of my research for Kathleen O’Connor of Paris, three things stand out. First, travelling to the places where Kate worked or lived. I believe people and place inhabit each other, and the search for traces of Kate never disappointed. Second, thanks to the generosity of Kate’s family, I had the opportunity to spend time with her personal possessions, the things she left behind when she died. These remnants of a life gave me insights into the way she lived and the things she valued, and it was thrilling to find items like her famous tortoiseshell bracelets, her paintbrushes and the ‘African rug’ that appears in many of her outstanding still lifes of 1920s Jazz Age Paris. What difficulties did you encounter, and how did you set about resolving them? Oh, there are many difficulties associated with writing about someone who was notoriously reticent about their private life, and who very likely weeded their papers of anything too personal. These were problems for which there was no neat solution, but I chose to handle them by writing the gaps and absences into the story, where they become part of the narrative of travel and research and provide a framework for speculation. I knew from the outset that there were also difficulties with identifying and cataloguing Kate’s artworks, because she deliberately changed titles and even dates from time to time, for various reasons—to disguise her age, for example, or after reworking old paintings. I decided to keep a very detailed inventory based on all mentions of particular works—no matter how small—so that details could be cross-checked and, occasionally, identifications made. It was laborious but it paid off on a number of occasions. Choose one extract from the book that you particularly like, and why you chose it. It’s an unusually mild day in March 1893, and the police paddock in Fremantle has been cleared of horses to make way for a cake fair. There’s a jostle of people, bright and loud—a good turnout that promises well for the Swan Boys’ Orphanage. Children with sticky fingers zigzag between long skirts. There are lamingtons and wedges of cream sponge and moustaches dusted in icing sugar. An occasional yelp and a frantic scraping of heels on the grass—reminders to the crowd of where they are, and to watch where they step. Little flotillas of ladies, hatted and gloved, gather around the cake stalls, arranging baked goods, dispensing tea, taking pennies and shillings and handing back change—cheerfully playing at shop girls for a day in the name of a worthy cause. There’s the Fremantle Rifle Volunteers Band playing lively airs, there’s a maypole dance for the children, there’s a large crowd gathered around Mr Watson, electrical engineer, who is demonstrating the operation of a galvanic battery. And over there, a play is about to be staged. For conservative colonial society in the port town, Bluebeard seems a surprising choice. It’s a grisly fairytale with a salacious reputation, and the three-act performance being stage-managed and directed by Aileen O’Connor is an exotic version that will become popular in Arthur Rackham watercolours just seven years after this little production. The wife-killer Bluebeard is an ‘Eastern despot’. The characters have names like Selim, Hassan, Fatima. The costumes on stage on this Saturday afternoon no doubt feature pantaloons and veils, and a lurid turban on Bluebeard’s head. I wonder whether she had to badger Aily into giving her the lead role. Did she have to compete for it with Eva? I can imagine Kate disdaining the lesser role Eva was given: the supporting part of Sister Anne, to whom Fatima calls piteously for help in the minutes before she is to be beheaded. It could be argued that Anne’s is the more heroic role of the two, but it’s a species of heroism consisting of sending the girls’ brothers to the rescue—essentially passive, enacted offstage. Where is the glory in that? It’s a gift, this snapshot of Kate at sixteen: an irreverent girl centrestage, playing against the grain. The story consists of five fragments, focused on women's experiences. This fragment is called 'Who is Sylvia' (the title alludes to Sylvia Plath's poem, 'Mirror,' about the female fear of ageing). It describes an academic feminist who believes that the different stages of the feminist movement have been increasingly liberating for women, only to succumb, in her later years, to self-denigration, based on her ageing appearance. Part of the intent of the fragment is to suggest the difficulty for even the most intelligent and knowledgeable feminist woman to free herself from the tyranny of appearances. Sylvia was the proudly steadfast product of 1960s feminism. Vigorously supporting the empirically verifiable claim that women as a group were subjugated by a pervasively patriarchal ideology, she also refused to be a victim, valiantly adhering to the social constructivist argument that patriarchal culture could be deconstructed and hence reconstructed to serve the interests of female empowerment. Later in the century, Sylvia eagerly embraced the philosophically liberating belief that the very category of femaleness was ambivalent and provisional, if not entirely untenable. 'Woman', she now saw, was gloriously elusive, defying the epistemologically reductive binary model of gender that historically rendered the female inferior to the male. On the morning of June 23rd, 2016, Sylvia noticed that her bedroom mirror was leaning to the side. She stepped back, stepped forward, made the necessary adjustment. But then, as both the subject and the object of her disconcerted gaze, she was jolted into studying her refection: for although her lover called her comely and her friends extolled her dignity, all she could see was a sadly wrinkled forehead and two listless, sunken cheeks; five deep rows of lines around a tight, scrawny neck; two sagging, dispirited breasts. She could find no words to rescue her. A prize-winning, best-selling and internationally acclaimed writer once pronounced, to general approbation, that "if a novel was a map of a country, a short story was the bright silver pin that marked the crossroads." Another writer, who'd never won a prize or sold a single copy of his only short story collection, had never received any form of approbation, whether general, colonel or sergeant, and who had always considered narrative (both the longer and shorter forms) to be an unequivocally temporal mode, pondered and puzzled over the use of those spatial metaphors by the prize-winning, best-selling etc etc writer. Did "the bright silver pin" refer to a structural landmark, a means of illuminating our crucial psychological, moral and existential choices in life? And did the writerly act of using said pin presuppose that our life-in-time was essentially comprised of turning-points, crises, epiphanies? In which case, those spatial metaphors were indeed misplaced, since they did not escape the inescapable temporality of our miserable life-in-time. And on re-reading what he had just written, hadn't he, the non-prize-winning etc etc writer, used a tautology in the preceding sentence. Or was it a redundancy? Self-editing had never been his strong point.